Great winemaking really does begin in the vineyard for Sagemoor’s inquisitive and talented vineyard manager. LACEY LYBECK hasn’t been in the wine business all that long, but she works with some of the titans of the industry — winemaking elder statesmen, but also vines that were planted in the early 1970s. In addition, Lybeck works with winemakers representing more than 100 wineries, meaning she is growing grapes for more than 10 percent of Washington wineries. Anyone who spends more than five minutes in a tasting room or winery cellar will undoubtedly hear the old trope about how winemaking begins in the vineyard. With Lybeck, that’s true, as she quizzes her winemakers on the style they’re going for and will adjust farming to accommodate, including tonnage, sun exposure and irrigation. Lybeck grew up on her parents’ 600-acre seed and vegetable farm near the Skagit County town of La Conner. 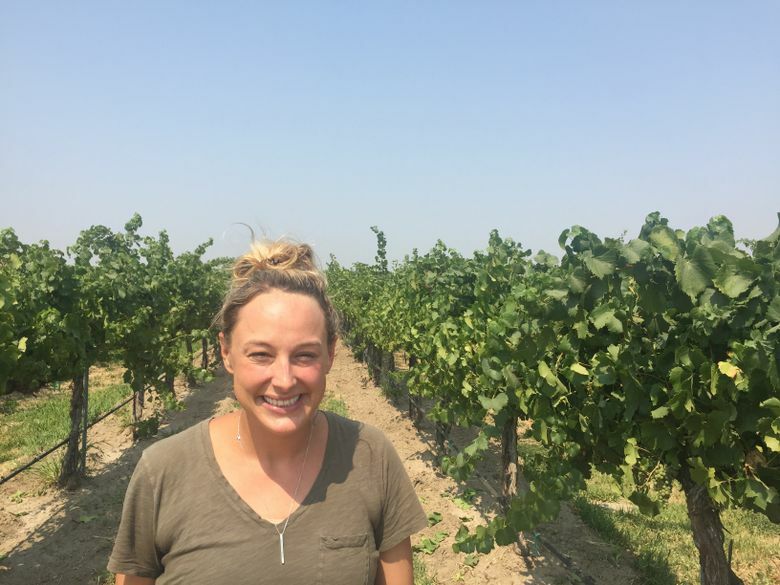 While earning a degree in agriculture at Washington State University, she became fascinated with grapes, particularly how each vintage is so dependent on growing conditions and farming. After graduating from WSU in 2010, Lybeck worked a harvest in New Zealand before landing an internship with Chateau Ste. Michelle, spending a lot of time in the Horse Heaven Hills. After nearly three years as a senior viticulturist with the Milbrandts, among the biggest grape operations in the state, she was hired by Sagemoor Vineyards as vineyard manager in 2015. First planted in 1972, Sagemoor now spans five vineyards: Sagemoor, Dionysus, Bacchus, Weinbau and Gamache; all are north of Pasco. Combined, they grow 21 varieties of wine grapes on nearly 1,100 acres. It was Washington’s first large-scale commercial vineyard, feeding a burgeoning industry in its infancy. Rob Griffin, of Barnard Griffin Winery in Richland, has brought in sauvignon blanc grapes from Sagemoor since 1987. Some of the vines were planted nearly 50 years ago, making them older than his daughter, Megan, his white-winemaker. From the Walla Walla Valley, winemaker Rick Small of Woodward Canyon uses Sagemoor cab vines planted in 1972 to make some of his most acclaimed reds.